More Miles. More Options. More Freedom. 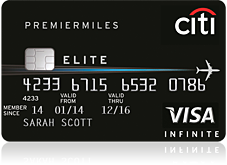 As a Citi PremierMiles cardmember you will automatically be enrolled into the Citi Rewards Program with which you can earn and redeem Citi Miles for a host of amazing redemption options which have been created keeping your needs in mind. Through the Citi Rewards Program, collect 3 Citi Miles on every US dollar of purchases in foreign currency and 2 Citi Miles on every US dollar of purchases in AED. Your Citi Miles never expire. Transfer your ThankYou ® Points to participating travel loyalty programs to redeem for flights, hotel stays and more on up to 1:1 basis with select partners, giving you the best conversion rates without being tied down to any given program. Citi Miles can be used to get a cash rebate on all kinds of travel-related spend made on your Citi PremierMiles Credit Card. Fly for free with any airline or enjoy free hotel stays, ferry trips and more around the world. If you wish, you can redeem your Citi Miles to cover the annual membership fee* for your Citi PremierMiles Credit Card. To get assistance and plan your dinner reservations, airline or theater tickets and much more. Get 5 supplementary cards for your family members. You don't have to pay any additional fee and can choose the spending limit on each card. Exclusive priority membership to leading Hotel Loyalty programs, through which you can enjoy free room night stays, room upgrades, dining or spa vouchers and much more. Entitled to complimentary Travel Accident Insurance cover, as well as compensation for inconvenience due to delayed or missed flights and luggage when your tickets are purchased with your Citi PremierMiles card. PremierMiles Program and Citibank Terms and Conditions apply, are subject to change and are available upon request. For the current Terms and Conditions, please visit our website www.citibank.ae. All offers are made available on a best-effort basis and at the sole discretion of Citibank, N.A. Citibank, N.A. makes no warranties and assumes no liability or responsibility with respect to the products and services provided by partners/other entities. All offers are made available on best effort basis & at sole discretion of Citibank N.A.